If you’re in search of available shipments for your fleet, then look no further. 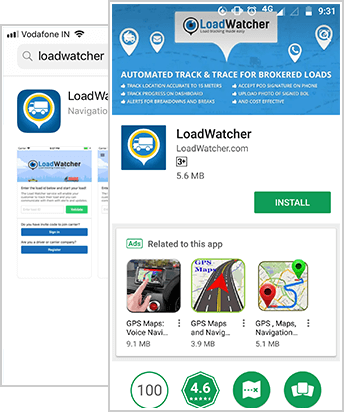 LoadWatcher allows fleet owners to search automatically through its platform for freight in the exact area of an empty truck, or within a specific zip code. 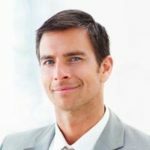 Once a shipment of interest has been identified, you can submit a new bid offer based off the customer’s target rate or your rate for that particular lane. Your bid will be automatically sent to the customer for approval. 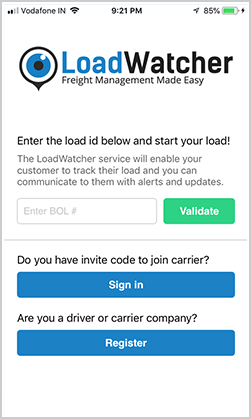 If you are selected as the carrier of choice for that shipment, all load information will be transmitted through the system to both you and the application on your drivers device. The driver is given turn by turn directions to both pick & delivery, the ability to check in/out of each stop so no more questions regarding detention, along with uploading the POD & BOL once delivered. 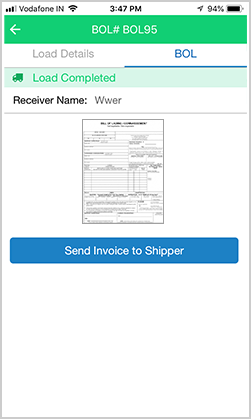 The carrier will also have the ability to send an invoice along with the proper paperwork i.e. POD, BOL, Toll receipts etc. to your billing teams email for approval. 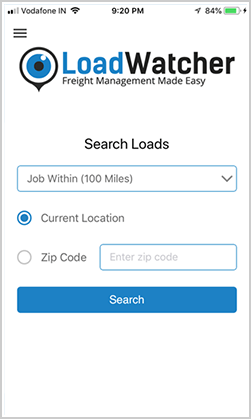 Selecting “Search Load” on the user’s application home page allows them to, select a radius of (100, 200 or 300 miles) from either their current location or a specific zip code user/driver intends on being available for their next shipment. 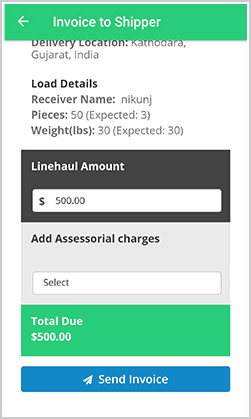 Once lane of interest is selected, a detailed list of that shipment will be displayed for the user/driver to better analyze and see if load fits their needs. 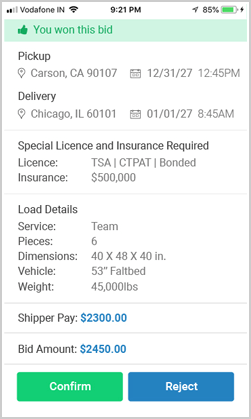 In addition to the shipment information above, user/driver will receive the miles to pickup and delivery, Special license and insurance required, and detailed load info i.e. team or solo, pieces and weight Dim, and weight by the shipper. 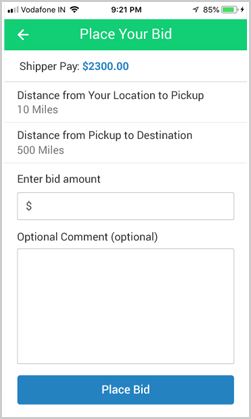 User/driver will have the ability to see total miles to better calculate the appropriate rate they wish to bid to the customer for a lane. User/driver also have the ability to add a note for the customer if needed. 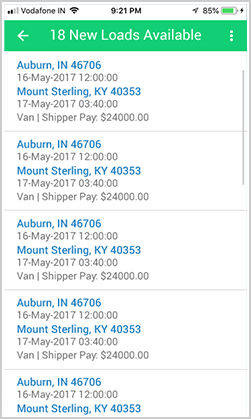 Once bid has been submitted user/driver will be taken back to the search screen listing all available shipments in their desired area of pickup so they may place additional bids to maximize their chances of capturing a load out of town. 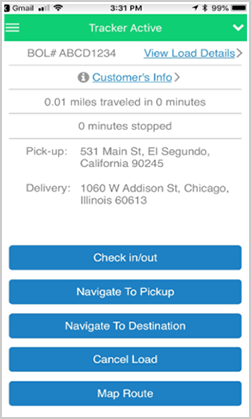 If customer selects carrier to haul their shipment the user/driver will receive a push notification alerting them that they have been awarded the shipment, user/driver will have 20 min to accept or deny the run. User/driver will need to agree to the terms and conditions and start the shipment, at which point the customer is now monitoring the user/driver. Once shipment has delivered, customer will have access to the load documentation at any time.